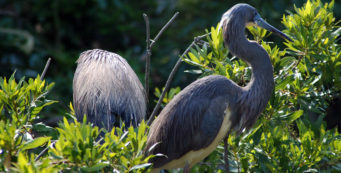 Identifying Birds in Florida | Florida Hikes! 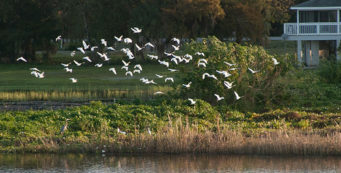 Florida is a prime destination for winter migrants, which is why so many birders flock to Florida, too. 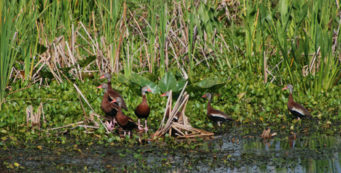 Here is our identification information for some of the bird species you’ll see in Florida almost any time of year. 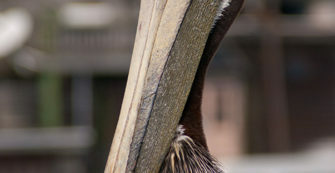 Brown pelican- The brown pelican is one of two species of pelicans found in Florida, the white pelican being the other. They have distinctive pouches under their bills and cannot be mistaken for the white pelican due to the size and color difference. Caracara- An unusual-looking Florida raptor, the crested caracara is Mexico’s national bird. They are members of the falcon family, but their heads look very parrot-like—a red face and a thick curved bill offset their black-and-white plumage. Cattle egret- A colonial nesting bird, the cattle egret is often seen in large flocks overhead in morning and evening, heading to and from their roosts and nests in shrubs along shorelines. 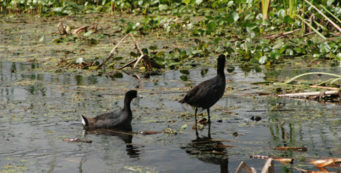 Coot- One of the most common birds you'll see in Florida's marshes, coots are among the noisiest. 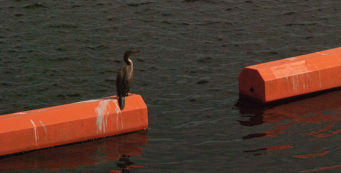 When they take off, they look like they're running on water before they launch into the sky. 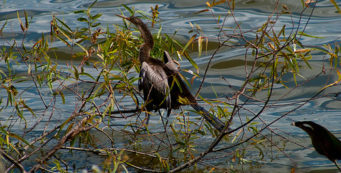 Cormorant- Cormorants can be easily confused with the anhinga, but are a more social bird. You’ll see them hanging out in groups. 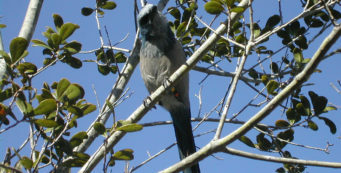 Florida scrub-jay- Seen in very specific scrub habitats with smaller trees, the Florida scrub-jay is only found in Florida, its population in decline and severely limited by lack of habitat. 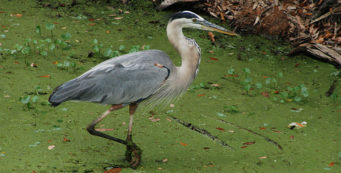 Great blue heron- A distinctive sight along Florida’s waterways, the great blue heron is the tallest of the blue-hued wading birds you’ll see hunting along the shorelines. 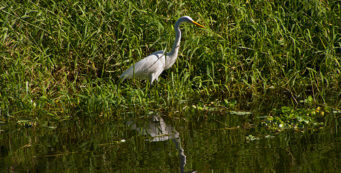 Great egret- The largest of the white-colored wading birds in Florida, the great egret is frequently seen in wetlands areas and along waterways. Green heron- Green herons look very much like the American Bittern from a distance. But the way they hold their neck and the iridescent green of the feathers on their backs help make them easy to identify. 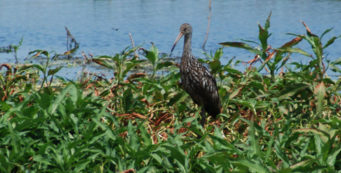 Limpkin- Chestnut-brown with white spots, the limpkin has a curved beak much like an ibis. 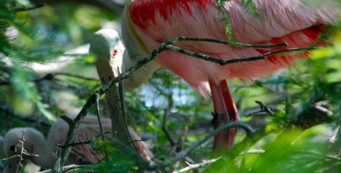 It is one of Florida’s more rare birds, and has been listed on the protected species list. 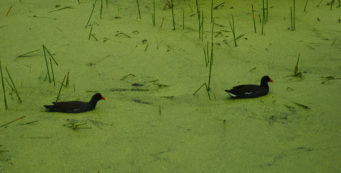 Its diet consists mostly of the apple snail. 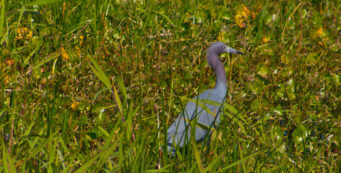 Little blue heron- Few wading birds sound genuinely upset when you walk past them, but the little blue heron sure kicks up a fuss - and usually moves away quickly, no matter how softly you walk. 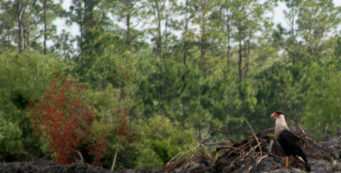 Louisiana heron- A distinctive white-bellied blue heron, the Louisiana heron is also known as the tricolored heron. 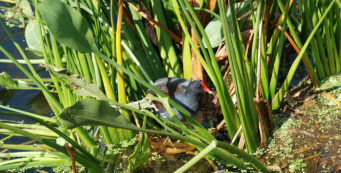 Moorhen- One of the noisiest residents of the marsh, the moorhen - also known as the common gallinule or marsh hen - has a distinctive red beak compared to their cousins the coots. 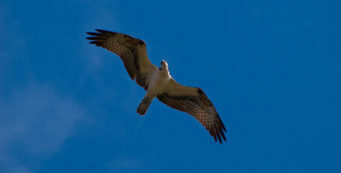 Osprey- The osprey is a large black and white raptor, up to two feet tall and with a six-foot wingspan. It dives for fish and is found near freshwater and saltwater habitats. 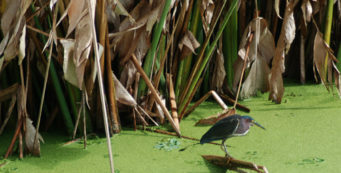 Purple gallinule- Florida's most beautiful waterbird is the purple gallinule, found year-round in fresh water marshes in the Florida peninsula. 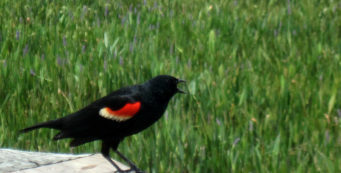 Red-winged blackbird- One of the most distinctive sounds you'll hear in a Florida marsh is the call of the red-winged blackbird, particularly when there are a large flock of them. Roseate spoonbill- There's no mistaking the roseate spoonbill, with its bright pink plumage and distinctive shovel-shaped beak. 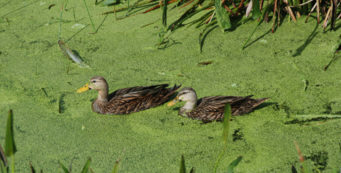 Usually seen in pairs or large groups, they feed on mud flats. 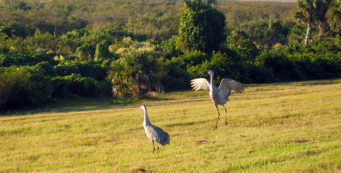 Sandhill crane- Tall, distinctive birds that you'll see everywhere in the Florida peninsula, sandhill cranes mate for life and travel in pairs or as a family. 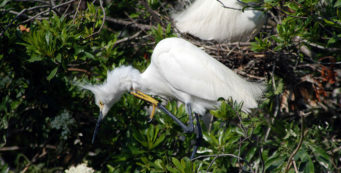 Snowy egret- Sometimes mistaken for other white wading birds in Florida, the snowy egret has distinctive yellow feet and a black bill. 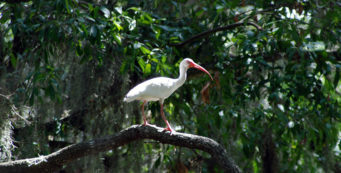 White ibis- Called curlew by native Floridians, the white ibis is a wading bird that tends to browse and travel in flocks. 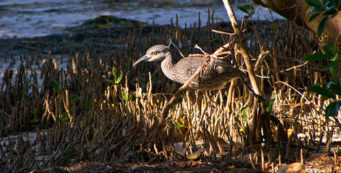 It is one of the more common wading birds you'll see in Florida. 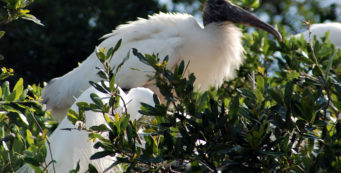 Wood stork- The only true stork native to North America, the wood stork can have a wingspan of over five feet. Once highly threatened due to habitat loss in its nesting areas, it's made a spectacular comeback.